The Adamus Condo project is now set to deliver its first phase of 24 units by the summer of 2018, with +/- 150 units in total when the residential complex is ultimately completed. Construction is projected to start in August on Beaconsfield’s only four-storey building on the land that previously housed the Club West Island Fitness facility on Alton Drive near Elm Avenue. 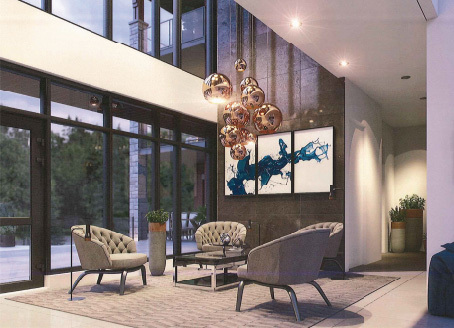 A sales office has been set up, showcasing plans of one-, two- and three-bedroom living spaces which will range from 699 to 1,692 square feet. The project is located close to all amenities including shops, restaurants, a recreation centre, a library, medical centres, schools, swimming pools, fitness centres and yacht clubs. Its proximity to several highways and a commuter train station offers quick access to a variety of destinations. As for prices, a one-bedroom condo with interior parking starts at $224,900 plus taxes and there is a one bedroom penthouse available for $376,900 plus taxes and a three bedroom condo at $465,900 plus taxes. The former Club West Island utilized 100 per cent of the land with building and asphalt whereas Adamus’ 65 per cent greenspace represents Beaconsfield’s first ever TOD (Transit Oriented Development). This focuses on walkable, mixed-use communities centered around high quality train systems, making it possible to live a lower-stress life without complete dependence on a car for mobility and survival. The building will feature floors, columns, and beams of steel and concrete, a masonry and metal exterior. Each unit will have an air exchanger unit and a balcony or terrace. There will also be a common area in the atrium. Units will have a ceiling height of nine feet. There will be full indoor parking, even for visitors and no asphalt views from balconies. “Adamus will place residents in the center of a vibrant community that puts a variety of services at their disposal,” said Frank Di Ciocco, director of development for KF Construction, the promoters of the project. “It is also close to major highways, commuter rail transit and public transportation.” Adamus has unveiled carefully conceived layouts and quality interiors crafted with great attention to detail: highly durable flooring, quartz kitchen countertops, walk-in closets in most units, quality windows and special consideration to sound proofing, are just a few of the highlights. Because accessibility and security are always primary concerns, amenities such as controlled access, a fire sprinkler system and an elevator have been included. City Council and its Land Use Sub-Committee have declared that the new Adamus Condo project is the perfect fit for the community. The Beaconsfield city council believes the developers went the extra mile to ensure everything was done properly. It is their wish for people to stay in Beaconsfield when they decide to downsize and sell their homes. Adamus also expects to attract young professionals wanting to live in Beaconsfield without the responsibilities that come with owning a detached house. 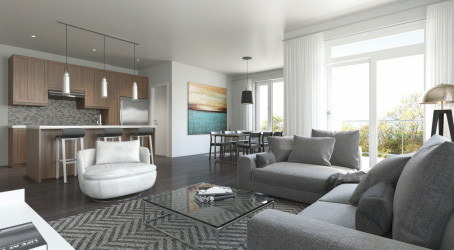 The Adamus condominium project is literally breaking new ground in Beaconsfield, as the first project with complete underground parking and abundant green space. Built on the 120,000-square-foot site of the old Club West Island Fitness facility at Alton Dr. and Elm Ave., Adamus will sit mere steps from the AMT’s Beaconsfield train station and a few blocks from Highway 20, which makes it a commuter’s dream, according to Gilles Champagne of KF Construction, the company developing the project. “The ability to live in a nice new, affordable condominium in a beautiful, quiet, West Island neighbourhood just a short walk to a train and to be downtown in 20 minutes has been unheard of until now,” he said. With construction of the 140unit, four-phase development set to begin this summer, and Phase 1 delivery scheduled for the following summer, the project’s launch was delayed slightly by a recent rezoning change, when developers opted to put a fourth-storey penthouse level on the building, while maintaining the original 13-metre height restriction. There were some objections to the project in the area, particularly over the height — which remains the same as original plans — and the fear of increased traffic, but a report from KF Construction shows the transformation from commercial to residential will not increase traffic and may, in fact, decrease local volumes. By adding that extra level, density is maintained within the existing footprint, Champagne said, thus “allowing 65 per cent of the lot to be maintained as green space.” With no views of asphalt outside the large windows of each unit, “a lot of projects talk about green space, but all our parking is underground, even for visitors — nothing on the street. That’s a really green green space.” What’s more, Adamus makes winter a little easier to take, with a heated driveway. Units range from 750 to 1,600 square feet with many plans to choose from, and prices begin at $210,000 (plus tax) along with $15,000 per parking space. 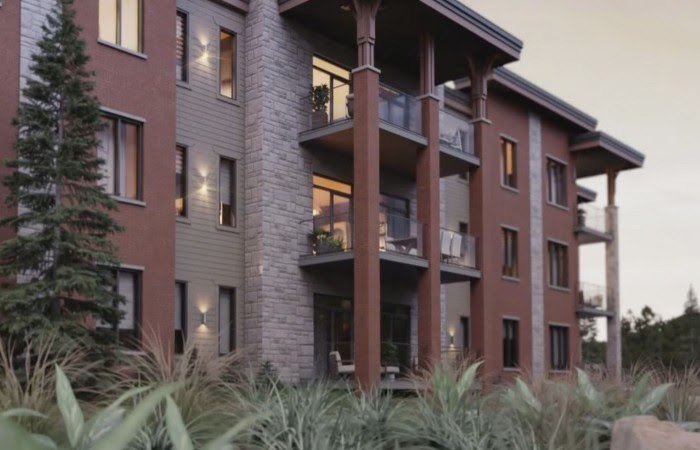 Penthouse units start at $600,000 and feature three bedrooms. Perhaps most striking about architect David Smith’s design is a light-filled, glassed-in atrium entrance that offers unique visual and actual access from the front right through the back of the building, to a beautifully landscaped common yard featuring abundant trees, shrubs, and a walking path. The atrium will also host common areas on all levels.